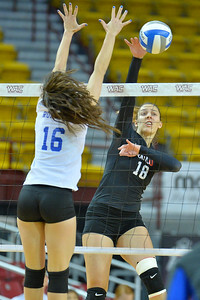 November 17, 2016; Las Cruces, N.M.; Seattle Redhawks outside hitter Katarina Marinkovic (18) hits a shot past CSU Bakersfield Roadrunners outside hitter Carol Grasso (16) during a first round match of the 2016 Western Athletic Conference volleyball championship tournament at the Pan American Center. 3-seed CSU Bakersfield defeated 6-seed Seattle 3-2. 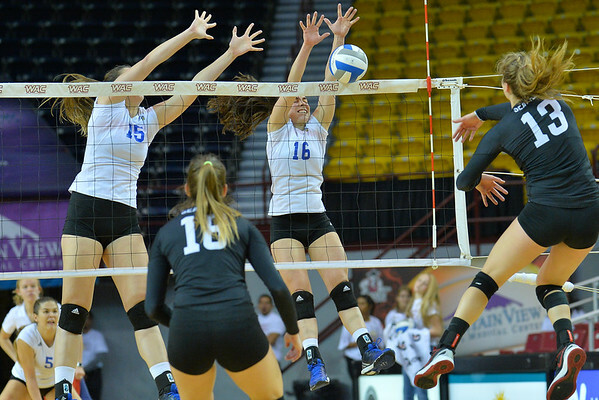 November 17, 2016; Las Cruces, N.M.; Seattle Redhawks middle blocker Maja Stojanovic (6) is blocked by CSU Bakersfield Roadrunners middle hitter Marina Sanches (15) and CSU Bakersfield Roadrunners middle blocker Sydney Haynes (13) during a first round match of the 2016 Western Athletic Conference volleyball championship tournament at the Pan American Center. 3-seed CSU Bakersfield defeated 6-seed Seattle 3-2. 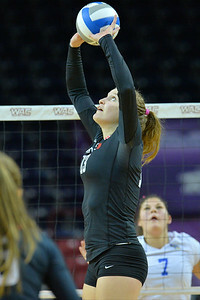 November 17, 2016; Las Cruces, N.M.; Seattle Redhawks libero Iris Ivanis (10) digs a ball during a first round match of the 2016 Western Athletic Conference volleyball championship tournament at the Pan American Center. 3-seed CSU Bakersfield defeated 6-seed Seattle 3-2. 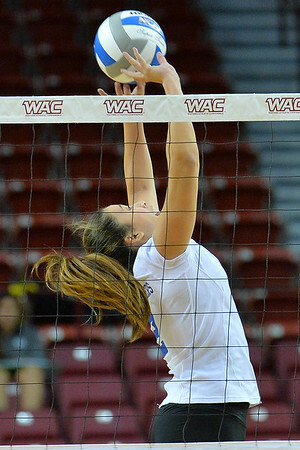 November 17, 2016; Las Cruces, N.M.; CSU Bakersfield Roadrunners setter Fabiana Andrade (2) sets a ball during a first round match of the 2016 Western Athletic Conference volleyball championship tournament at the Pan American Center. 3-seed CSU Bakersfield defeated 6-seed Seattle 3-2. 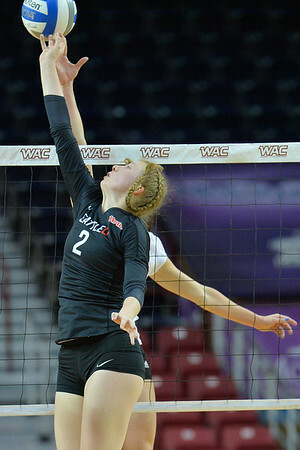 November 17, 2016; Las Cruces, N.M.; Seattle Redhawks outside hitter Matea Mamic (12) goes up for a block attempt during a first round match of the 2016 Western Athletic Conference volleyball championship tournament at the Pan American Center. 3-seed CSU Bakersfield defeated 6-seed Seattle 3-2. 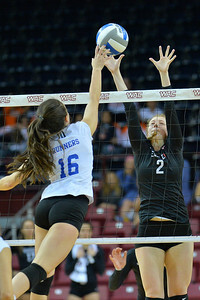 November 17, 2016; Las Cruces, N.M.; Seattle Redhawks middle blocker Kory White (9) goes up for a block attempt on a swing by CSU Bakersfield Roadrunners middle hitter Katie Dunbar-Lowe (9) during a first round match of the 2016 Western Athletic Conference volleyball championship tournament at the Pan American Center. 3-seed CSU Bakersfield defeated 6-seed Seattle 3-2. 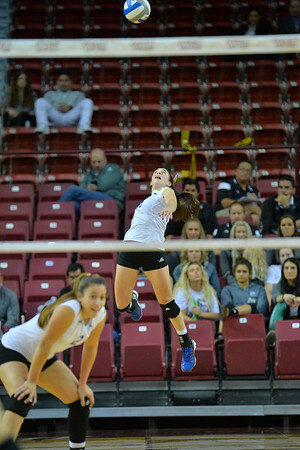 November 17, 2016; Las Cruces, N.M.; Seattle Redhawks outside hitter Katarina Marinkovic (18) takes a swing against CSU Bakersfield Roadrunners middle hitter Katie Dunbar-Lowe (9) and CSU Bakersfield Roadrunners middle hitter Kortney Freeland (11) during a first round match of the 2016 Western Athletic Conference volleyball championship tournament at the Pan American Center. 3-seed CSU Bakersfield defeated 6-seed Seattle 3-2. 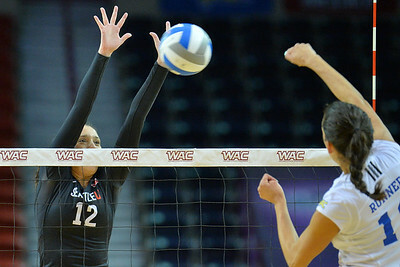 November 17, 2016; Las Cruces, N.M.; Seattle Redhawks outside hitter Katarina Marinkovic (18) tips a ball over the CSU Bakersfield block during a first round match of the 2016 Western Athletic Conference volleyball championship tournament at the Pan American Center. 3-seed CSU Bakersfield defeated 6-seed Seattle 3-2. 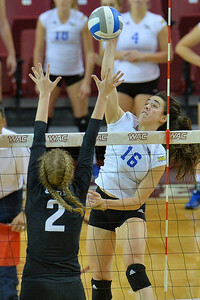 November 17, 2016; Las Cruces, N.M.; CSU Bakersfield Roadrunners outside hitter Carol Grasso (16) tips a ball over the block of Seattle Redhawks setter Kerry Lane (2) during a first round match of the 2016 Western Athletic Conference volleyball championship tournament at the Pan American Center. 3-seed CSU Bakersfield defeated 6-seed Seattle 3-2. 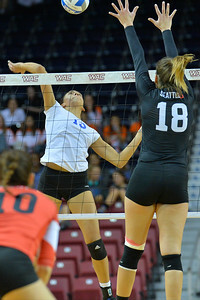 November 17, 2016; Las Cruces, N.M.; Seattle Redhawks outside hitter Katarina Marinkovic (18) tries to hit through the block attempt from CSU Bakersfield Roadrunners outside hitter Carol Grasso (16) during a first round match of the 2016 Western Athletic Conference volleyball championship tournament at the Pan American Center. 3-seed CSU Bakersfield defeated 6-seed Seattle 3-2. 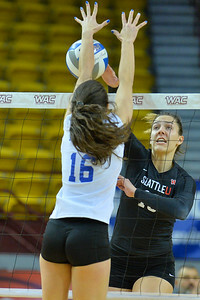 November 17, 2016; Las Cruces, N.M.; CSU Bakersfield Roadrunners outside hitter Carol Grasso (16) takes a swing over the block attempt from Seattle Redhawks setter Kerry Lane (2) during a first round match of the 2016 Western Athletic Conference volleyball championship tournament at the Pan American Center. 3-seed CSU Bakersfield defeated 6-seed Seattle 3-2. 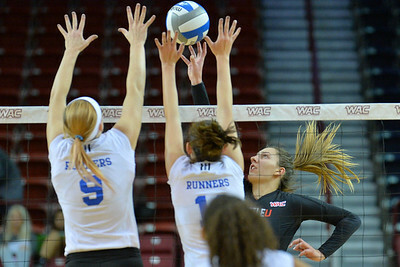 November 17, 2016; Las Cruces, N.M.; Seattle Redhawks setter Shae Harris (13) hits into the block attempt from CSU Bakersfield Roadrunners outside hitter Carol Grasso (16) and CSU Bakersfield Roadrunners middle hitter Marina Sanches (15) during a first round match of the 2016 Western Athletic Conference volleyball championship tournament at the Pan American Center. 3-seed CSU Bakersfield defeated 6-seed Seattle 3-2. 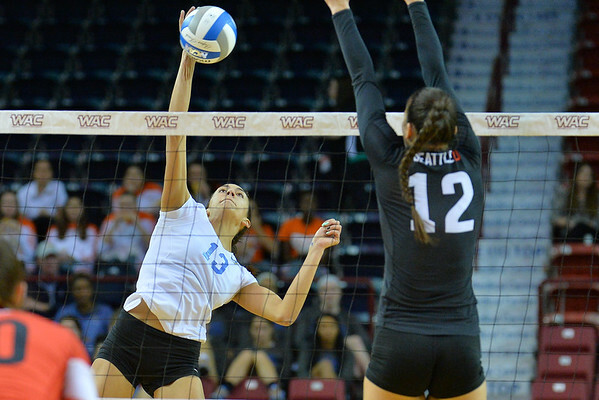 November 17, 2016; Las Cruces, N.M.; CSU Bakersfield Roadrunners middle blocker Sydney Haynes (13) takes a swing against Seattle Redhawks outside hitter Matea Mamic (12) during a first round match of the 2016 Western Athletic Conference volleyball championship tournament at the Pan American Center. 3-seed CSU Bakersfield defeated 6-seed Seattle 3-2. November 17, 2016; Las Cruces, N.M.; Seattle Redhawks setter Kerry Lane (2) tries to save an overpass during a first round match of the 2016 Western Athletic Conference volleyball championship tournament at the Pan American Center. 3-seed CSU Bakersfield defeated 6-seed Seattle 3-2. 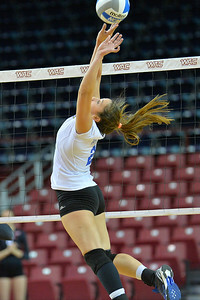 November 17, 2016; Las Cruces, N.M.; CSU Bakersfield Roadrunners outside hitter Carol Grasso (16) hits a top spin jump serve during a first round match of the 2016 Western Athletic Conference volleyball championship tournament at the Pan American Center. 3-seed CSU Bakersfield defeated 6-seed Seattle 3-2. 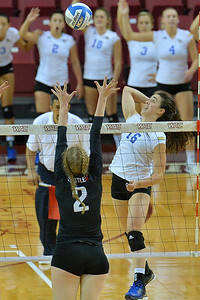 November 17, 2016; Las Cruces, N.M.; CSU Bakersfield Roadrunners middle blocker Sydney Haynes (13) takes a swing against Seattle Redhawks outside hitter Katarina Marinkovic (18) during a first round match of the 2016 Western Athletic Conference volleyball championship tournament at the Pan American Center. 3-seed CSU Bakersfield defeated 6-seed Seattle 3-2. 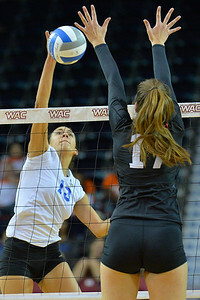 November 17, 2016; Las Cruces, N.M.; CSU Bakersfield Roadrunners middle blocker Sydney Haynes (13) takes a swing against Seattle Redhawks outside hitter Mila Duarte (17) during a first round match of the 2016 Western Athletic Conference volleyball championship tournament at the Pan American Center. 3-seed CSU Bakersfield defeated 6-seed Seattle 3-2. 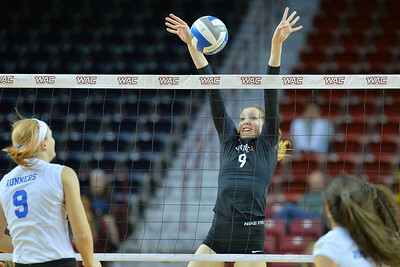 November 17, 2016; Las Cruces, N.M.; Seattle Redhawks setter Shae Harris (13) sets a ball during a first round match of the 2016 Western Athletic Conference volleyball championship tournament at the Pan American Center. 3-seed CSU Bakersfield defeated 6-seed Seattle 3-2. 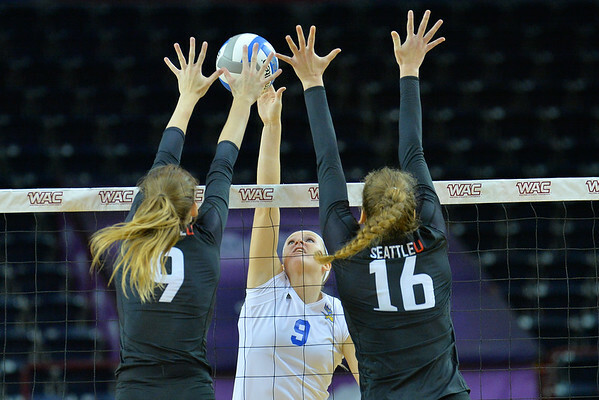 November 17, 2016; Las Cruces, N.M.; CSU Bakersfield Roadrunners middle hitter Katie Dunbar-Lowe (9) tips the ball over the block attempt of Seattle Redhawks middle blocker Kory White (9) and Seattle Redhawks outside hitter Katarina Glavinic (16) during a first round match of the 2016 Western Athletic Conference volleyball championship tournament at the Pan American Center. 3-seed CSU Bakersfield defeated 6-seed Seattle 3-2. 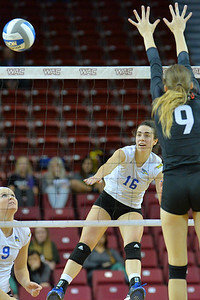 November 17, 2016; Las Cruces, N.M.; CSU Bakersfield Roadrunners outside hitter Carol Grasso (16) hits a ball pst the block attempt from Seattle Redhawks middle blocker Kory White (9) during a first round match of the 2016 Western Athletic Conference volleyball championship tournament at the Pan American Center. 3-seed CSU Bakersfield defeated 6-seed Seattle 3-2.